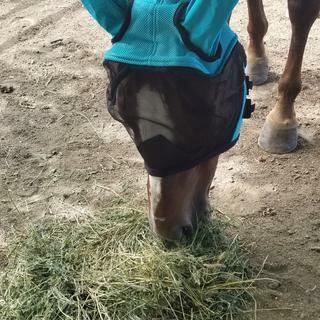 This fly mask provides extreme comfort and visibility while protecting your horse's eyes and ears. Comfort mesh around the ears and jaw moves with your horse to provide comfort and protection. The fine durable mesh allows for optimal vision day and night, while "quick grip" closures ensure a secure fit. best mask I have used ever, wish it came in other sizes, especially smaller. I love this fly mask and the color is awesome! BEST ANSWER: This item is to fit an average size horse approx. 800-1000 lbs. The Tough-1 fly mask with ears runs very small. It didn't fit my Quarter horse but it does fit my Welsh Cob. Does the Tough-1 Deluxe also run so small? BEST ANSWER: This item is to fit an average size horse approx. 800-1000 lbs, the only difference in the item you ordered and the deluxe. The deluxe offers mesh around ears and jaw moves with your horse to provide comfort and protection. Does this fly mask have ears? BEST ANSWER: Yes, it has ears.